One of my favorite meals is a sesame ginger salad (I’ll get the recipe up here sometime). It has a unique twist, is refreshing, and makes my taste buds extremely happy. This dip is a play on that salad. A cream cheese base layered with some tasty toppings all pulled together with a dressing that will make you want to come back for more. This post is part of a series. 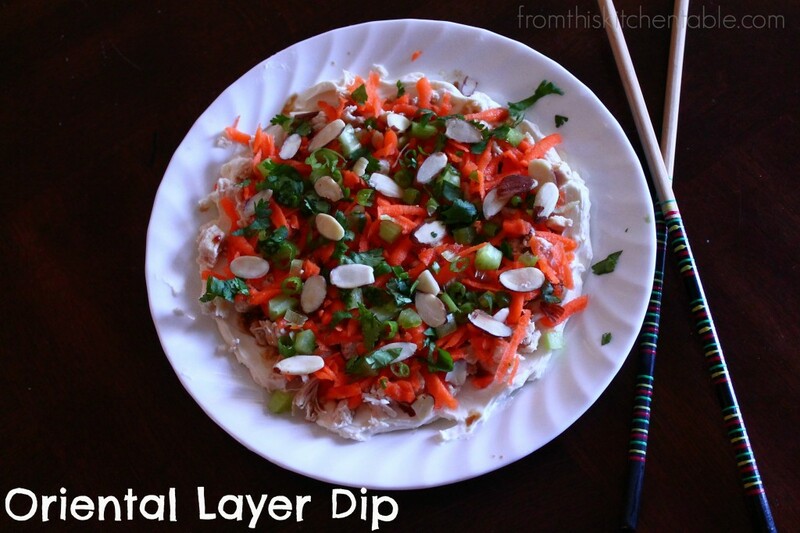 Don’t forget to find all the recipes for layer dips with an international flair here. Place all the dressing ingredients in a small bowl and mix with a fork. Combine the cream cheese and milk and cream and stir until smooth. Spread on the bottom of a glass platter or dinner plate. Layer the chicken on top of the cream cheese and drizzle with a little over half of the dressing. Next layer the carrots and then finish by sprinkling on the remaining ingredients. Adjust topping ingredients amounts according to the size of your plate. Finish by drizzling with the remaining dressing. Every Friday in January I’m going to be sharing a layered dip with flavors from around the world! Be sure to subscribe via e-mail, like us on Facebook, and follow on Pinterest so you don’t miss out. This entry was posted in Uncategorized on January 24, 2014 by Deanna Michaels. This sounds yummy! For us gluten-free folks, I could use rice crackers or cucumber slices. I’m pinning this to my First Communion board as I get ready for our FC party in May. It is really tasty and unique! Love the idea of rice crackers or cucumber slices. I’m going to remember those. Thanks for pinning and commenting! Thx for posting on Thank Goodness it’s Monday. I’m on the lookout for good vegetable side dishes and salads, and this fits the bill! Pinned it. This dip is so tasty. I love fresh ginger so the dressing is fabulous. Hope you guys enjoy it. Thanks for stopping by and for pinning! I’m a big sesame ginger salad fan too! This recipe sounds great! It is fabulous! Thanks for sharing about Tell Me About It Tuesday – I shared it there. I love dip and can’t wait to try this! Thanks for stopping by Tell Me About It Tuesday. I love dips too! These one are all super yummy and more unique! 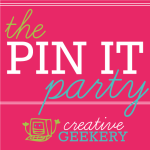 Linking up via the Let’s Get Real linky party! It is really good! All the dips recipes have been yummy and unique. I love the Indian one too. Actually, maybe I love them all. 😉 Thanks for stopping by! Hi Deanna! I’m stopping in from Let’s Get Real today. Looks like you have another hit. This dip looks fantastic. I don’t know that it will go with my menu for Sunday so guess what that means……………..need to throw another party soon. I shared it on FB for everyone to see. Ha ha! It makes me hungry re-looking at these pictures each Friday too! Have a great weekend. I hope you like them! They are tasty. The Indian one I could eat with a spoon and I might have even eaten some of this plain. A dip like this is great because it is so easy to customize. Thanks for joining the WWDParty! You are so right! Being able to customize is awesome and it’s pretty unique so you don’t have to worry about someone else bring the same thing as you. 🙂 I’m bringing of the dips to our Super Bowl party! You always have the most delicious recipes to share, and thank you once again for linking up with us at #WWDParty. I look forward to your posts every Friday. Have a wonderful weekend. Thank you for bringing your creative dip to the Family Fun Friday! I am pinning it for later! Blessings! This looks delicious Deanna! I can’t wait to try it! SO glad that you linked up to Motivation Monday! Thanks for stopping by and for commenting! Glad that you think it looks good. It is pretty tasty! This dip sounds yummy! Have you tried it with veggies chips? Thanks for sharing and for linking up with us at the Weekend Wind-Down Party, hope to see you again next weekend! God Bless! I haven’t tried it when veggie chips, but that sounds really good! (I might have even some of it plain, so I think it would be good no matter what it was on. 🙂 ) You’ll have to let me know what you serve it with if you ever try it! This sounds and looks amazing. I must make this soon! Thanks for sharing at The Weekend Retreat, hope to see back on Thursday. Thanks for linking up to Good Tips Tuesday last week. This looks amazing! Pinned! It is pretty tasty! Yum, there is just something about dips. Exactly! Ginger is amazing. I loved this dip too. Thanks for pinning. Cream cheese is the magic word, ha! Might have to try this!! Hey Kiddo, I just saw you are featured at Let’s Get Real Friday’. I am THRILLED for you! CONGRATS!! !